On a bright summer morning, a teacup poodle drowned in the Bestler's backyard swimming pool. At first Lynne Bestler, who'd gone out ot sneak in a solitary swim before her kids woke, thought it was a dead squirrel. Which would've been bad enough. But when she steeled herself to scoop out the tangle of fur with the net, she recognised her neighbour's beloved Marcell. For Fox, Caleb, Gage, and the other residents of Hawkins Hollow, the number seven portends doom - ever since, as boys, they freed a demon trapped for centuries when their blood spilled upon the Pagan Stone. Their innocent bonding ritual led to seven days of madness, every seven years. And now, as the dreaded seventh month looms before them, the men can feel the storm brewing. Already they are plagued by visions of death and destruction. But this year they are better prepared, joined in their battle by three women who have come to the Hollow. Layla, Quinn, and Cybil are somehow connected to the demon, just as the men are connected to the force that trapped it. Since that fateful day at the Pagan Stone, town lawyer Fox has been able to see into others' minds, a talent he shares with Layla. He must earn her trust, because their link will help fight the darkness that threatens to engulf the town. But Layla is having trouble coming to terms with her new found ability - and with this intimate connection to Fox. She knows that once she opens her mind, she'll have no defence against the desire that threatens to consume them both. This book was a bit of a disappointment to me. I can’t deny it wasn’t well written because it was but I felt a little like I had been duped, because the plot seemed very similar to the first book in the series, Blood Brothers which I loved to bits. The story returns to Hawkins Hollow after the newly formed group of six had won their first battle with the darkness that haunts the town every seven years. In the first book, I was thrilled to read that Caleb had fallen for the feisty investigative reporter Quinn. In this book, it felt a little déjà vu as Caleb’s friend Fox, began to fall in love with Layla, Quinn’s friend. Shall we take bets on what will happen in the third book with the last two members of the group? As much as I wanted to see all six become three loving couples, it felt too predictable, way too obvious to the story. So I found it difficult to work my way through it without gritting my teeth in annoyance. The plot didn’t seem to advance that much further than the last book which I found disappointing. At the end of this book, they face the darkness yet again in a similar way, showing the action culminating in the last couple of chapters. As I said earlier, I felt duped, as though the wool had been pulled over my eyes and that I wouldn’t realise it would have been easier to combine the stories from all three books into one which would have made it a much sharper, more action packed thriller. 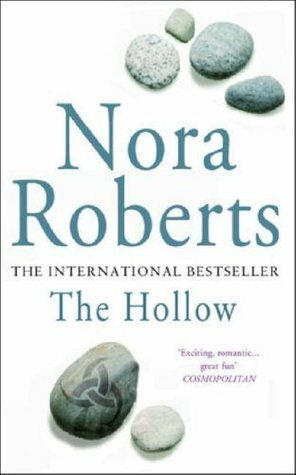 This is only the second book that I have read by Nora Roberts and to be honest, I am now not sure I want to read more. As much as I love the characters and the town, I’m not sure if I feel compelled enough to finish the series. This book definitely suffered second book syndrome so perhaps I should continue to the end because I can only imagine that it will be explosive, especially after building in tension extremely slowly for the previous two books. I’m curious what Nora Roberts books my lovely readers have read and enjoyed. I if you have found one that you love, please let me know because I want to read one that I will love.